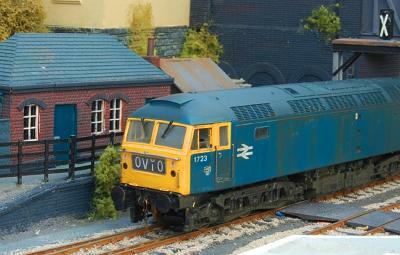 Abbotswood Junction is a father and son collaboration between Phil and James Bullock. The prototype is situated just south of Worcester, where the ex LMS Gloucester to Birmingham line is joined by a chord from Norton Junction on the ex GWR Worcester to Oxford line. This is a OO layout featuring DCC Sound and working semaphore signals. 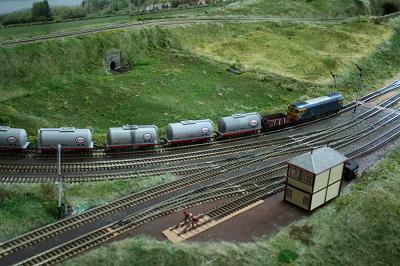 The layout is a trains in the landscape layout and is set in the period 1967 to 1973; end of steam to TOPS period, although we may stray to 1977. Green and blue diesels running on trains representative of the period at this location are featured; and preserved steam could appear! The premise is that the Stratford to Cheltenham line closed when through services finished in 1965 and so the layout at Abbotswood has had to be expanded to accommodate extra trafnc. An up loop with a direct connection to the Worcester chord (this was only ever a kick back siding) has been laid in and the layout has been resignalled to accommodate this prior to the Gloucester MAS scheme. Unfortunately there has recently been a derailment on the Worcester chord so all services are having to run via Bromsgrove, this is until phase 2 of the layout including Norton Junction is built. 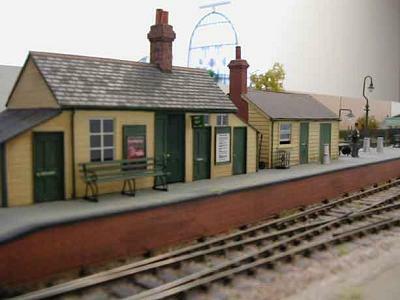 Bleakhouse Road is a model of the main intermediate station on the erstwhile Glastonbury & South Somerset Railway. The line was built at the turn of the century and ran in a south—westerIy di- rection from Glastonbury via the villages of Walton and Pedwell across the peat moor to a junction with the West of England main line at Athelney. The line was single throughout, with one crossing place at Bleakhouse Road. In 1911 the South Polden Light Railway was built from Bleakhouse Road across the levels to a number of peak works near Westonzoyland and Burrowbridge. At the height of production during the 1920s it in turn was fed by several narrow gauge tramways. In 1937 the Government established an Army stores depot at Burrowbridge, which continued to be rail-served until its closure in 1964. The Army maintained its own motive power at the depot, which occasionally ventured down the Light Railway as far as Bleakhouse Road on transfer trips. The section south from Bleakhouse Road to Athelney was closed to passengers in 1951 and to freight in 1952. The rest remained open to passenger and freight traflic until the final closure of the S&D in March 1966. The main reason for its survival was the transfer of peat traffic from the light railway to the 'mainline' at Bleakhouse Road, occasional Army traffic from Burrowbridge and sun-dry wagonload traffic for the surrounding agricultural district. Peat was generally transported in box vans. The light railway closed at the same time as the S&D, although the narrow gauge tramway feeding the Bleak Moor works survived into the early 1970's, when the peat works itself closed. 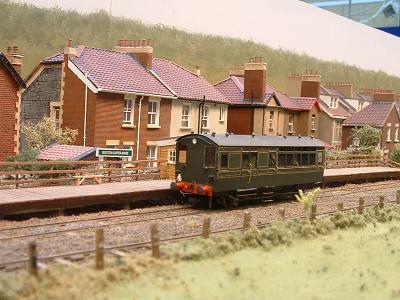 The model is set in the period between 1959 and 1964 and features the end-on junction with the light railway and the nearby level crossing at Ham Lane. The peat works of the Bleak Moor Peat & Sedge Company is also featured. Locomotives from Templecombe and Highbridge sheds typically shared the passenger and freight workings on the branch to Bleakhouse Road. These included 'typical' S&D motive power, together with more recent W.R. 'interlopers' such as 22xx 'Collett Goods' and Pannier tanks. A variety of industrial and former main line tank locos worked the light railway. Folly lane is a modern image layout using stock that could be seen in the period from 1996 to the present day. Rolling stock is from Bachmann, Heljan, Hornby, and other manufacturers of modern image stock. The layout is fully wired out to DCC standards and is controlled by a Gaugemaster Prodigy Advance system which also provides a sound system. All trackwork and points are Peco and point operation is electrical. Lighting is provided on the layout and all signals are working. 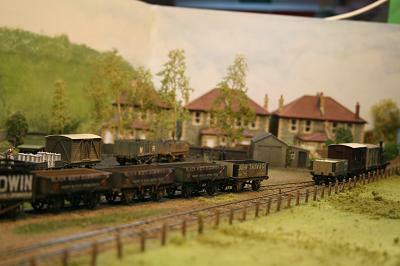 This layout is a very new purchase on behalf of the Bentley Club from the builder Grahame Hedges. It is a representation of a scene in South London in the modern era. A close examination of the layout will show clues to the date and the location of the area represented, but it is an amalgamation of a number of places and buildings known to the builder, the rolling stock obviously but also look out for the ATM, the Gatso road safety camera, wheely bins as well as the direction signs and road markings. With one small exception all of the buildings are scratch built in card and then painted and Hnished by Graham. I am informed that the graffiti apparently mainly refers to a South London Football Club. 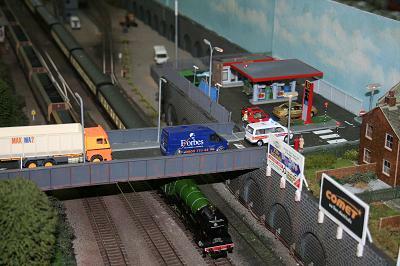 This is we feel an excellent model of a fictional South London scene complete with a imaginary tube station on the Northern, or is it Victoria line? 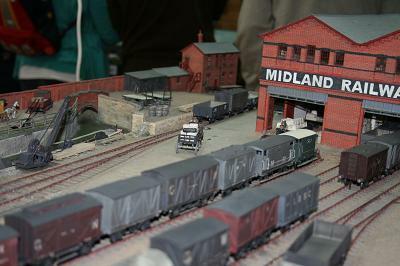 The layout is an attempt to portray a corner of the Midland Railway Goods Station in Nottingham around 1923 although there have been a few adjustments deemed necessary. The original tall square warehouse with a canal entrance as well as the usual road and rail ones was omit- ted as at over half a metre high, it was impracticable to model so I substituted Burton—on-Trent's Cheese and Corn Warehouse number 2. It makes a nonsense of the canal to some extent but is not completely out of place. The canal may look as though the barge would not be able to pass through but I can assure you that before I detailed the arches etc I did check it. The main warehouse has been left open on 2 sides in an attempt to show how goods had to be manually transferred from rail to road vehi- cle and sometimes stored in the building. Most period photographs show these yards as being crammed with wagons and horse drawn road vehicles. I am not sure that this was always the case but I try to match the evidence with as many vehicles as I can. This layout, which is a direct crib from the famous Timesaver type lay- outs which are very popular in North America, was built in response to a Chairman's Challenge made to Oxford M.R.C. 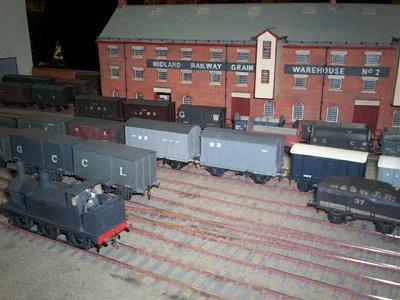 members, for a working model railway in 8 square feet. 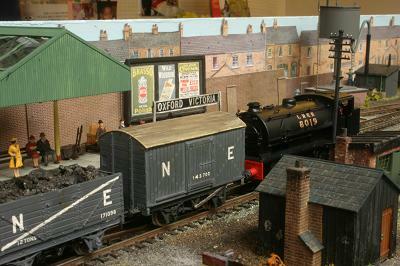 The layout shows a small suburban station somewhere in the outskirts of Oxford. I have supposed that the Metropolitan Railway did actually build the proposed line from Quainton Road to Oxford. The station entrance is loosely based on the similar structure at Quorn on the Great Central London extension. Instead of a whole station my layout represents part of a station with platforms running into the hidden section blanked by a concrete wall at one end and also under a road bridge at the other. This not only avoids having to build multiple aspect signals, ticket barriers and the like but gives the illusion of a much bigger station - perhaps even a through one. Equally such scenic devices strengthen the idea of the station not just being in an angled cutting like Gatwick but part of a very moden cut-and-cover railway - as used for the Heathrow Express for example. This is the model railway where Children can become Engine Drivers on the Island of Sodor and has of course been inspired by the Reverend Audrey books. Our Thomas and Friends layout has been built for ten years now and in that time we hope it has encouraged many new railway enthusiasts to build a train set of their own. Originally it was intended as a space filler at shows so needed to be small, easy to transport and have a simple track plan, easy for small children to operate. 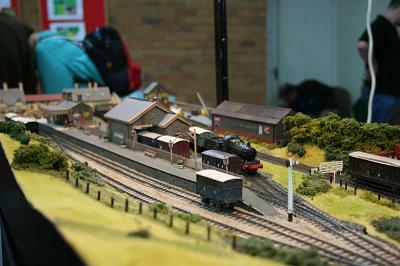 After its first appearance it was clear this model railway would have to be included at all our exhibitions. It incorporates a tunnel, station, level crossing together with locomotive and goods facilities. Train drivers should look out for many of the popular characters; Henry, Percy, Toby, Cranky, the Troublesome Trucks, not forgetting the Sir Topham Hatt better known as the Fat Controller. The famous anthropomorphised rolling stock is mostly from the Thomas range and we are sure most of the adults and all the kids will love it. Happy Driving, but please observe the track speed limits. West Harptree, which is an actual village in North Somerset, is the ter- minus of a fictitious GWR branch line with its junction at Hallatrow on the Bristol and North Somerset Railway. The period is set between the Wars when the day excursionists from Bristol and surrounds liked to take the waters of Chew Valley and Blagdon Lakes, whose existence, at this period in time, is also fictitious, also they have been greatly en- larged to take small pleasure steamers. West Harptree is the main village for the lakes having a small pier [not modelled], gift shops and tearooms and is also the focal point for the area's industry having a dairy, Farmers' Association stores, builders merchant and of course the local coal merchant. Hallatrow was the junction for the actual Camerton branch (of Titfield Thunderbolt and Ghost Train fame), which has been retained, but has had a fictitious link line added to the Somerset and Dorset Joint Rail- way at Midford with a south facing junction, at the southern end of the viaduct, which enables through running from that line to West Harptree for both freight and passenger trains. All this keeps the West Harptree branch very busy!! 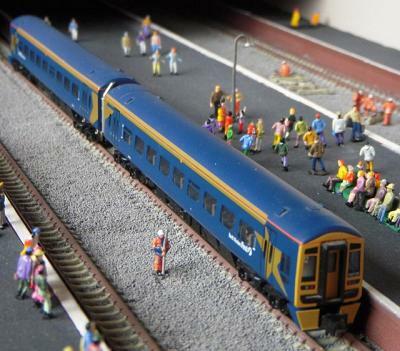 The model is built to the scale of 3mm to the foot with a track gauge of 12mm ('lT). The track is Peco code 80 rail in 3mm Society Ratio sleeper units and the hand built points have been purchased from 3SMR, a 3mm specialist shop. Most of the engines are kit bodies (some much modified for variety) on 3SMR chassis with Branchlines gearbox and motors. The coaching stock is mostly scratch built with most of the freight stock originating from the 3 mm Society or one of the other 3mm specialist suppliers, of which both operators are proprietors of one - Finney & Smith Kits. 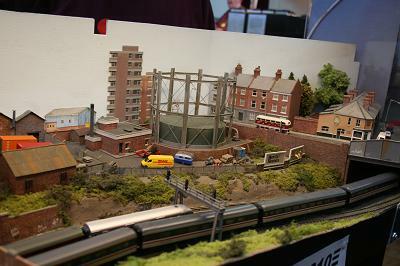 If you like what you see and want to "model railways" and not just take things out of a box, don't be put off by the idea you cannot get anything for 3mm nowadays; ask the operators for details of the 3mm Society and other specialists, especially our own kits. 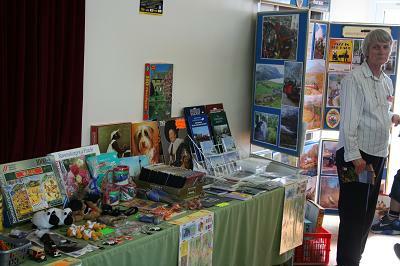 A selection from these is usually available from the layout. 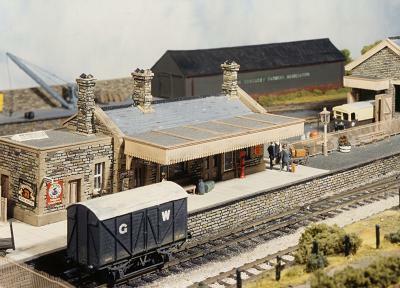 Scenery is based on concepts taken from Landscape Modelling by Barry Norman published by Wild Swan. The layout featured in British Railway Modelling for January 2000. The Weston, Clevedon and Portishead Railway opened from Weston to Clevedon as a tramway in 1897, converted to a 'Light Railway' in 1899 and extended to Portishead in 1907. It allowed local residents travel between the towns without need for lengthy inland detours via the Great Western Railway. It imported coal for merchants and gas works and exported a considerable amount of limestone from quarries in the Gordano Valley. In financial difficulties from the beginning, 'CoIonel' H F Stephens was appointed General Manager in 1911 but despite returning occasional profits, the fortunes of the line steadily declined and the last train ran on 18 May 1940. The WC&PR's rolling stock was typically run down, second hand equipment, bought cheaply from other railways, some of which were also run by Col Stephens. The layout is a virtually dead scale representation of the Ashcombe Road terminus in Weston—super-Mare as it was in the mid 1930s before the south side of the line was developed. With the exception of the station, all buildings remain today and the trackbed is a footpath. Stock is a mixture of kit built and scratch built items. 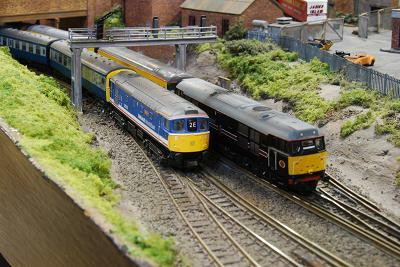 The layout has been featured in Model Railway Journal No 162 and the Railway Modeller February 2007 issue. 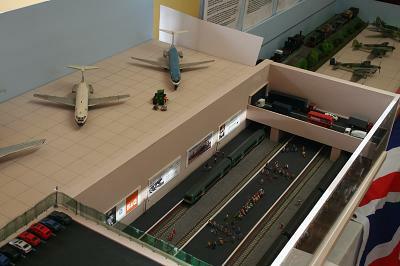 Westonmouth Central is the third layout that the builder has set in the fictional city of Westonmouth. Situated on the Bristol Channel coast the city has a large modern dock complex to the north, and a popular holiday beach to the south. 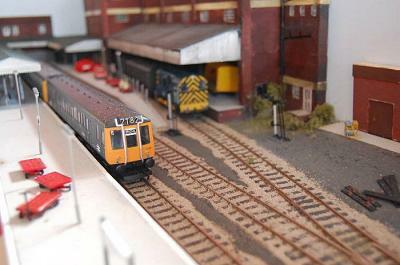 The loco stabling point for the area, Westonmouth Hillside, was the first layout in the sequence (and is now confined to home), Mortimore's Yard is a small set of exchange sidings serving what remains of the city's historic dock industries, whilst the project seen here represents a small part of the city's main passenger station. The layout is set in the mid-1970s, when the distinctive Western Region hydraulics were in decline, and the newer class 50s were making the depot fitters lives a nightmare! Mark 1 coaches dominate the passenger rakes, whilst parcels trains still feature some pre—nationaIisation vehicles. Plain blue, suburban style D.M.U.s ply their trade on local services. In the mid-1970s the railways still had a distinct regional atmosphere; it was very much the traditional railway, in this case the Great Western, but with diesels. The buildings of the station reflect that lack of change, although the new Power Signal Box is a rude intrusion on the scene and is a harbinger to things to come. 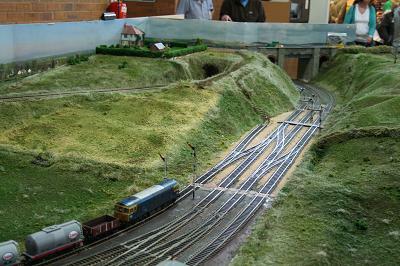 The layout was initially built as an entry for the 2007 Diesel & Electric Modellers United competition marking the 50th anniversary of Cyril Freezer's classic "Minories" track plan. The rules of the competition specifically "3 platform faces" have been interpreted to allow the representation of 3 platforms of a larger station, rather than a whole station, yet at the same time rather less than the maximum permitted space has been used. In this way the long platform at the front of the layout is actually a bay platform, and where the viewer stands the main through platforms would lie. The shorter middle "dock" platform comes into its own in the evening for the loading of mail and parcels traffic but during the day is more likely to be "home" for a large mainline locomotive waiting to take over an Inter-Regional train. Similarly the station pilot loco may be found there between duties or perhaps a defective coach that has been removed from a passing train (or, more likely, a disgraced class 50!). As well as meeting the rules of the competition one aim of the layout is to act as a photographic background, where stock projects can be recorded in a natural setting. The opportunity was also taken to move to finer scale track (C&L) and a first attempt at building a turnout. 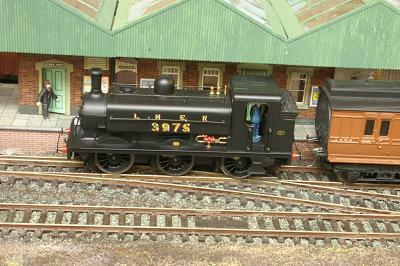 The layout is controlled by Digital Command Control, using a Lenz Set 90, and Silver decoders. 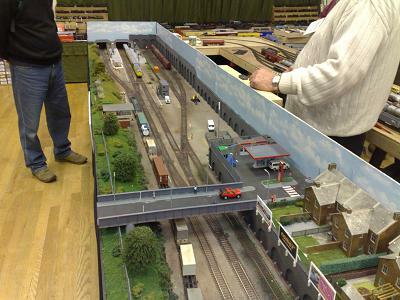 Following the death of Cyril Freezer earlier this year the layout is presented as a tribute to his original Minories plan, and indeed his work for our hobby as a whole.